viaLibri ~ A COMPARATIVE ESTIMATE OF THE MINERAL AND MOSAICAL GEOLOGIES. A COMPARATIVE ESTIMATE OF THE MINERAL AND MOSAICAL GEOLOGIES. 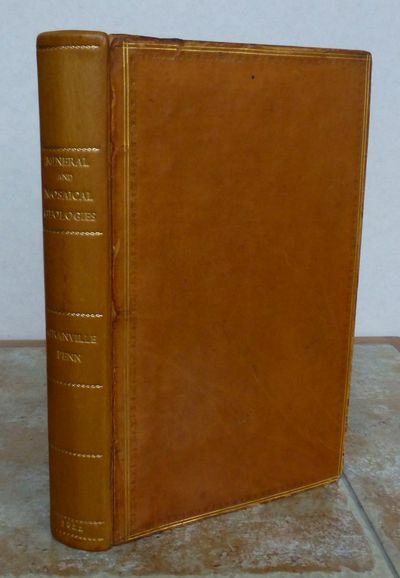 London, printed for Ogle, Duncan and Co., 1822.. FIRST EDITION, 1822. 8vo, approximately 220 x 135 mm, 8½ x 5¼ inches, pages: vii, 1-460, divded into three parts, bound in full calf, rebacked in modern new calf, gilt lettering and decoration to spine, double gilt rules to edges of covers, marbled endpapers and edges, bookplate to first pastedown of "Robert Washington Oates". Binding rubbed and shelf wear to edges and corners, occasional pale brown mark, otherwise a very good tight copy. A supplementary volume was publlshed a year later. In 1954 Gilbert Whites former home, The Wakes, came up for sale but a public appeal to secure the house did not raise sufficient funds until Robert Washington Oates came forward. Robert Washington Oates was an antiquarian book lover and dealer and admirer of Gilbert Whites work. A relation of the Antarctic explorer Captain Lawrence Oates and Victorian explorer Frank Oates, he was, at that time, seeking a suitable home for his family memorabilia, archives and library. He donated substantial funds, enabling the property to be secured and two trusts were created to run the house as a museum and library in memory of Gilbert White and the Oates family. MORE IMAGES ATTACHED TO THIS LISTING, ALL ZOOMABLE, FURTHER IMAGES ON REQUEST. POSTAGE AT COST.